Branched-chain amino acids (BCAAs) are important nutrient signals that have direct and indirect effects. Frequently, BCAAs have been reported to mediate antiobesity effects, especially in rodent models. However, circulating levels of BCAAs tend to be increased in individuals with obesity and are associated with worse metabolic health and future insulin resistance or type 2 diabetes mellitus (T2DM). A hypothesized mechanism linking increased levels of BCAAs and T2DM involves leucine-mediated activation of the mammalian target of rapamycin complex 1 (mTORC1), which results in uncoupling of insulin signalling at an early stage. 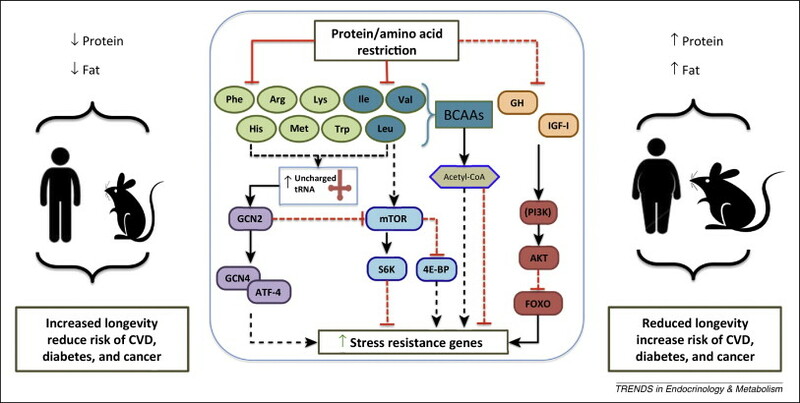 A BCAA dysmetabolism model proposes that the accumulation of mitotoxic metabolites (and not BCAAs per se) promotes β-cell mitochondrial dysfunction, stress signalling and apoptosis associated with T2DM. Alternatively, insulin resistance might promote aminoacidaemia by increasing the protein degradation that insulin normally suppresses, and/or by eliciting an impairment of efficient BCAA oxidative metabolism in some tissues. 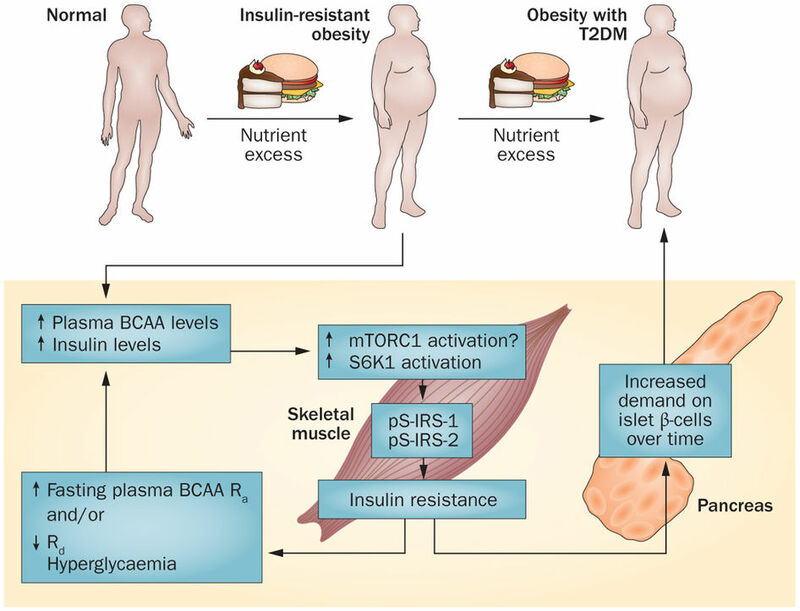 Whether and how impaired BCAA metabolism might occur in obesity is discussed in this Review. Research on the role of individual and model-dependent differences in BCAA metabolism is needed, as several genes (BCKDHA, PPM1K, IVD and KLF15) have been designated as candidate genes for obesity and/or T2DM in humans, and distinct phenotypes of tissue-specific branched chain ketoacid dehydrogenase complex activity have been detected in animal models of obesity and T2DM. 2.2 Role of Food Intake and BCAA Oxidation in Elevating BCAAs in Obesity. Elevated levels of branched-chain amino acids (BCAAs) have recently been implicated in the development of cardiovascular and metabolic diseases, but the molecular mechanisms are unknown. 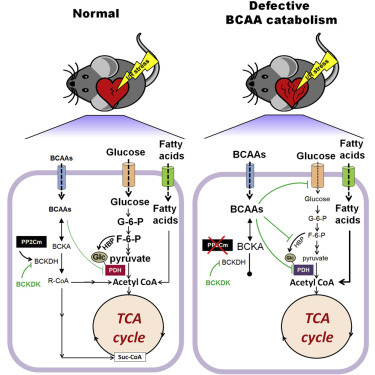 In a mouse model of impaired BCAA catabolism (knockout [KO]), we found that chronic accumulation of BCAAs suppressed glucose metabolism and sensitized the heart to ischemic injury. High levels of BCAAs selectively disrupted mitochondrial pyruvate utilization through inhibition of pyruvate dehydrogenase complex (PDH) activity. Furthermore, downregulation of the hexosamine biosynthetic pathway in KO hearts decreased protein O-linked N-acetylglucosamine (O-GlcNAc) modification and inactivated PDH, resulting in significant decreases in glucose oxidation. Although the metabolic remodeling in KO did not affect baseline cardiac energetics or function, it rendered the heart vulnerable to ischemia-reperfusion injury. Promoting BCAA catabolism or normalizing glucose utilization by overexpressing GLUT1 in the KO heart rescued the metabolic and functional outcome. These observations revealed a novel role of BCAA catabolism in regulating cardiac metabolism and stress response. •Protein or AA restriction has been shown to be as potent as calorie restriction in extending healthspan in multiple model organisms. •AA restriction affects lifespan partly through modulation of the amino acid sensing pathways TOR and GCN2. •Human epidemiological studies highlight the detrimental effects of high protein diets, in particular animal-derived protein sources in contrast to plant-based sources. •Epidemiological studies indicate that low protein diets are associated with lower risk of chronic and age-related diseases such as CVDs, diabetes, and cancer. Many of the effects of dietary restriction (DR) on longevity and health span in model organisms have been linked to reduced protein and amino acid (AA) intake and the stimulation of specific nutrient signaling pathways. Studies in yeast have shown that addition of serine, threonine, and valine in media promotes cellular sensitization and aging by activating different but connected pathways. Protein or essential AA restriction extends both lifespan and healthspan in rodent models. In humans, protein restriction (PR) has been associated with reduced cancer, diabetes, and overall mortality. Thus, interventions aimed at lowering the intake of proteins or specific AAs can be beneficial and have the potential to be widely adopted and effective in optimizing healthspan. 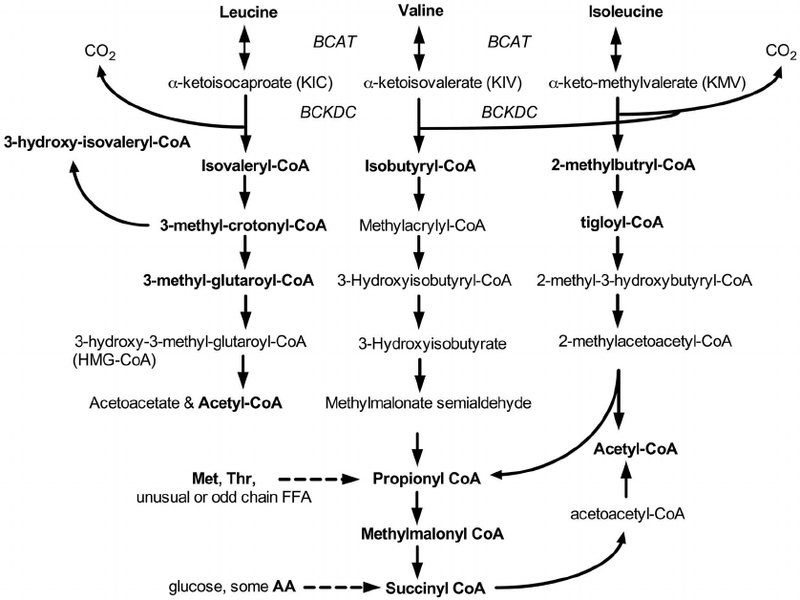 Schematic of whole-body BCAA metabolism. Ketoacids are formed by reversible transamination catalyzed by the mitochondrial or cytosolic isoforms of branched chain amino acid transaminase (BCAT). The action of the branched chain keto acid dehydrogenase complex (BCKDC) in the mitochondrial matrix leads to the evolution of CO2 rom the 1-carbon of the keto acids including KIC, which was 14C labeled and measured from the expired air in these studies. Subsequent intramitochondrial metabolism leads to the formation of various acyl-coenzyme A (R-CoA) esters that can reversibly form acylcarnitines (not displayed). Neither FAD and NAD Cofactors nor CO2 and H2 O substrates are displayed. Bold font indicates metabolites or corresponding acylcarnitines that were detected and measured quantitatively in the 24 h urines (Table 4–5). AA, amino acids. Role of Food Intake and BCAA Oxidation in Elevating BCAAs in Obesity. An obvious factor contributing to elevated BCAAs and BCKAs in the obese rats appears to be increased BCAA intake, because animals were sampled in the fed to early-postabsorptive state. The mitochondrial isoform of branched chain amino acid transaminase (BCATm) catalyzes the first step in BCAA metabolism in most peripheral tissues. However this enzyme is absent in liver thereby allowing BCAAs in particular to rise postprandially so they may act as a circulating signal of a protein containing meal. We found that BCAA intake per g body weight was 23% greater in obese animals. While the percent rise in food intake is not as great as changes in BCKAs or metabolites in various compartments, food intake is clearly a contributing factor. It is noteworthy that virtually all other studies examining blood BCAA in obese humans or rodents were conducted in the overnight-fasted state, suggesting that obesity-associated increases in blood BCAA in those cases could not be due solely to differences in dietary input. Another potential factor that can contribute to elevated BCAAs in obesity is their rate of disappearance via complete BCAA oxidation, which could potentially be reduced in the obese state. Our observation of increased urinary BCAA-derived metabolites in obese Zucker rats is consistent with increased overall BCAA catabolism, at least through the first steps of BCAA oxidation. Consistent with this view, whole-body Leu oxidation as measured by 1-14C-Leu radiotracer was also increased, with the caveat that evolved 14 CO2 only marks the first step in Leu oxidation and does not imply complete oxidation. A decrease in the concentration/activity of enzymes downstream in the BCAA metabolic pathway relative to the incoming substrate load might contribute to accumulation of upstream metabolites reflective of incomplete BCAA oxidation. An example of this is our finding of elevated urinary 3-OH-isovalerycarnitine in obese rats. Elevation of this urine metabolite is used clinically to signal a block or deficiency in 3-methylcrotonyl-CoA carboxylase. 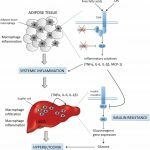 Consistent with this possibil-ity, genomic studies indicate down-regulation of gene expression along the whole BCAA metabolic pathway in liver and/or adipose tissue in the insulin-resistant or obese state, for reviews see [13,32,33]. The issue of complete versus incomplete BCAA oxidation, the relative roles of substrate excess versus enzyme activities in situ, and the tissue origins of systemic and urinary BCAA derivatives are areas that warrant further study. 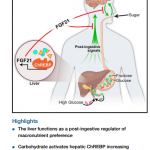 FGF21 – a liver hormone linking sugar cravings and cardiovascular disease.